Feng Shui house numbers can often determine whether or not a person will buy a home, at least in China. In fact, two Chinese lucky numbers for a house are eight and nine. Numbers in most cultures play a significant role, one that is often a subconscious reaction such as the number 13. In many cultures, this represents an unlucky number, yet, in the Chinese culture, it sounds like the word for a long life. However, if you take numerology to the next step, 1 + 3 = 4, then you're back to the inauspicious number 4. As you can see, this can become a game, or it can drive you crazy. 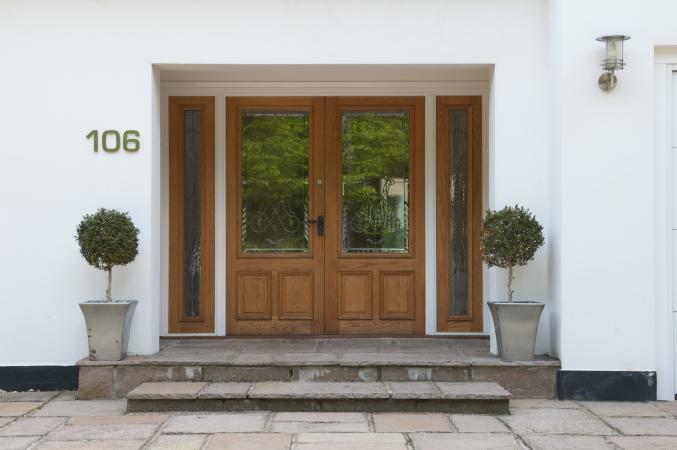 It's better to take a step back and consider the philosophy behind house numbers. The belief that the numbers on your home, in other words your street address, can impact your life, especially your finances is based on the philosophy of auspicious and inauspicious numbers. Unlike many cultures where the neighborhood you choose to live in will determine the kind of lifestyle you enjoy, the number theory is all about the number. In these cultures, your house number alone can determine your home's resale value. There are no feng shui principles regarding this number belief system for an address, per se, but over time it has become indoctrinated into modern feng shui practices by creating a kind of paradigm. Therefore, practitioners treat it as a significant aspect of feng shui. Clearly, feng shui is about the placement of your home within the elements. Nevertheless, house numbers are something feng shui practitioners must be consider since it's an accepted truism of feng shui. This crossover probably occurred because of the significance that numbers play in feng shui, especially those in which feng shui masters consider to be auspicious and inauspicious. This number belief system stretches far beyond your home. It embraces all numeric assignments from your social security number to your telephone number. Many people who go into business select numbers with as many eights as possible to ensure financial success. Others select auspicious numbers for their license tags, and so on. The Chinese believe certain numbers can aid you in life by attracting specific energies into your life. Some numbers can bring good fortune to you. Other numbers can bring the opposite result. Feng shui is about balancing the negative and positive, so it's only natural that the philosophy should also encompass both aspects of numbers. What Determines a Fortunate Number? There are certain factors that dictate whether a number is auspicious or inauspicious. You determine the number's rank of fortune by its sound when enunciated. The governing language for this is Cantonese. For example, the number four sounds like the Cantonese word for death and therefore is considered very inauspicious. People avoid having this number in their home addresses. Perhaps it was first a kind of psychological response that gradually became an accepted norm. No one knows for certain. The most auspicious numbers, again based on the sound of the numbers, are eight and nine. The number eight sounds like the word for rich or wealth. Number nine equates to a long life or eternity. Many consider the number two as the number for a blissful marriage. Number six will attract energies to help you have a smooth life with few obstacles and bumps. You've gone house hunting and found your dream home, but the house number is 444. Don't panic. It may seem that you are doomed to miss out on the perfect home for you and your family. There is an easy feng shui cure for this malady. All you need to do is change out your house number sign. It sounds too simple, but it should be with all things feng shui. All you need to do in order to neutralize the negative effects of the dreaded number four is to encircle the number. That's all. Once the 444 has a nice circle around it, enclosing all of the numbers, you can move into your home confident that the negative energies usually drawn and associated with the number four is stopped dead in their tracks, to add a pun. Numerologists believe that numbers contain and attract certain vibrations and energies. While the house number philosophy may not be an ancient feng shui practice, numerology always has been, especially when it comes to the homeowner and other resident's birth dates. The house birth date (date of completion) is vital to feng shui mapping such as flying star reports. It's only logical that you would want your house number to not be conflicting to the other numerological aspects of your home. In the scheme of things, energy is always the overall concern of feng shui assessments and re-alignments. A house number should then only be a small element in the overall feng shui picture. Now that you know what to look for in feng shui house numbers, you can go house hunting without fear. Remember, if you find the ideal house but the number isn't auspicious, you can apply the circle remedy and still have your dream house.